Age requirement - Gateway to Canada | Canada Immigration Consultancy! Last week, we received notices from embassy for our clients (permanent residence visa) filed in 2004. About a couple of hundred clients are being instructed to update their documents, and it is expected that in 6 months time from submission, they'll get the result. Now, some of them are worried because of their age. Bacause it took 4 years to process their application, some of them are older than 49 years old already. 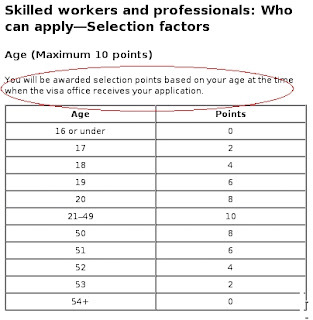 To get the maximum points, using the points system, under the age factor, one must be between 21-49 years old age bracket. What is the basis for age factor? Relax, no need to worry.